So I really haven’t had much time to post anything new or finally add my new recipes to the page. It’s been a whirlwind of a year and I am loving all the challenges my new job brings. I was inspired by a coworker to start posting again since I am passionate about sharing information and all the things I’ve learned on my journey to becoming healthier from the inside out. That said…watch for new recipe links and posts and some important updates on vitamins for adults and children. Life being …. well, life, I will get back in the habit of posting. I am working on spending more of my time doing what I feel is important. For me that is family, learning new things(really loving the research on interaction of vitamins with mechanisms and pathways of the brain and the whole idea of epogenetics…amazing!) and of course sharing information. It is hard to know what effects GMO foods have on us. There is no real long term studies. That said, there are enough studies to know that GMO foods and highly sprayed foods are probably not good for us! Eating on a budget and trying to be as healthy as possible eating little to no GM foods is tough since the price tag can be REALLY high! For ex. I usually buy apples, green granny smiths. A month ago, my bag of organic (so not GM) was $4.98 regular price at big box store (at little local market, same size bag, organic, but grown closer to home was $5.99). Last weekend…my apples…big box price $6.98 and local market, $9.99! Now, I know they are out of season…but seriously! wow! Since we are under a tight budget at the moment…finally trying to pay off some debt and save for an actual vacation, I put together a list of what I am doing in order to cut costs overall, and specifically for buying produce. As for the produce…here is my plan. What veggies I don’t use up for a meal, if I have no need for it, I will chop it up, bag and label it, freeze it for later use in soups. So, the last few months I have noticed my grocery bill almost double! This is crazy because I literally buy almost the same things each week. I have been cutting corners and trying to find every little way to shop on a budget. Yikes…hard to do. I have come up with a list for you to help try and keep costs of buying healthy food down. Order grassfed meats locally and only buy what you need. Find a local source for your eggs. You may not save money because you will probably have a bit of a drive to get them, but they will be better quality. Talk to your local health food store about ordering things you always keep on hand in bulk. They may be able to help you out. Costco is good for some things…but watch out because it is tempting to over spend. Good things there…Mary’s best crackers, coconut flour, unsweetened coconut, wheat free oats, coconut oil, avocado oil and baking soda. I would love to see our Costco bring in BPA free cans of coconut milk…yeah, in my dreams! Grocery shop on a Thursday…I have NO CLUE why, but every time I shop on a Thursday, everything is in stock AND my bill is cheaper. Know what to buy organic and what you can pass on. Buy local is sometimes cheaper, sometimes not. Factor in the drive and your time! Remember too, just because it is at your local farmers market DOES NOT mean it is locally produced. At my farmers market they import the same organic peppers from mexico as superstore BUT charge double the price at the farmers market. Buying frozen isn’t always bad…if its on sale, organic AND frozen…do it! And stock up. Frozen is great for adding to soups. Make more soups. They are filling, esp with good fats from the ground beef or lamb, AND you can throw in as many veg as you want. They seem to last and last so it stretches your budget and can be frozen for later. Grow your own food. I am the worst gardener, ask my hubby! But I can grow kale, tomatoes, carrots, basil and mint all in pots in my yard. I make my own tomato sauce with the tomatoes and basil that I can and freeze for use during the year. So, I have only had my Blendtec for a week and a half and I’ve already used it 45+ times! I am in love with it for almost everything…except making cauli mash. I didn’t think too smooth would be an issue but it gets it so smooth my husband and I cannot stand it. My daughter on the other hand LOVES how smooth it is. Great, now I have to make two versions for the freezer!!! Anyways. 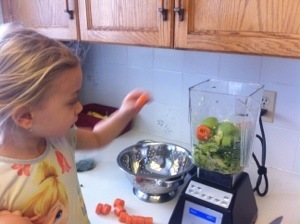 I have been experimenting with whole food smoothies to get more veggies, fats and stuff into myself and my daughter. Usually I let the kids choose what fruits and veggies to put in but now we have moved onto experimenting on what colors of smoothie we can make. We have done red, orange, purple and now green. They have all been a hit. 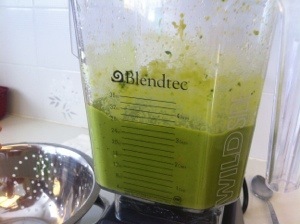 When you make things in a Blendtec, it makes a lot so either you need to share it between kids or with an adult. This recipe made 3 children portions or one child and one adult. 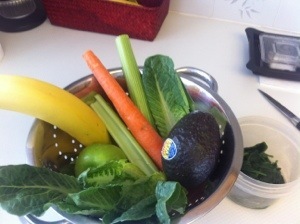 Wash and chop all veggies and fruit. Put them into your blender in order of softest to hardest. This makes it easier for blending. If adding in collagen wait until the smoothie is done to do a small blend in so you don’t destroy the protein. We have a “whole foods” button that you just press and watch it turn into a smooth shake. Make sure to consume it within 1/2 hr to get all the nutrients from it. It will stay good in the fridge for 24 hrs but it may loose some nutritional value…although I am no expert on this…just what I’ve read. Some of the ones that I love to come back to are Plantain Pancakes and French Toast Bread. I will repost them below, but all credit goes to this awesome mama! The one recipe I cannot wait to try is the crepes…I make my crepes at the moment with potato starch but I know that isn’t great for you (unless you are consuming it raw as a resistant starch for probiotic gut purposes). My problem is finding green plantains…odd I know but when ever I go grocery shopping the plantains have almost always started to turn. BOO! Yum for caramelizing desserts but not for starchy breakfasts or refeed days. Let cook 4-5 minutes on the first side, until the top looks fairly dry with little bubbles in it (just like regular pancakes!). Flip! And cook on the second side for 1½-2minutes. Repeat with remaining batter, adding a little more coconut oil to your pan as needed. 2. Using a standing mixer, beat the egg whites until stiff peaks form (you can also do this with a hand mixer or even by hand if you prefer). 4. Gently pour the yolk mixture onto the egg whites. Add about half of the sifted coconut flour. Gently fold the mixtures together. As they start to combine, add the rest of the sifted coconut flour. Fold until fully combined. 5. Pour batter into prepared baking dish and spread out evenly. Dust with extra cinnamon, if desired. Bake for 18 minutes, until golden brown and spongy to the touch. 6. Very shortly after removing from the oven, lift the flat-bread out of the pan (using the sides of the wax paper, or just flip the whole thing over onto a cutting board). Carefully peel the wax paper off the bottom. Slice into squares and enjoy warm or refrigerate for later. Everyone around here loves these carrots. They look not the most appealing but they taste amazing. As soon as I get some nice little carrots I will post a picture! Preheat oven to 400. Throw the carrots on a pan with parchment and drizzle oil over carrots and coat well. Mix the spices together then sprinkle over carrots. Put them in the oven and turn heat down to 350. Roast until tender but crisp. 15-20 minutes. 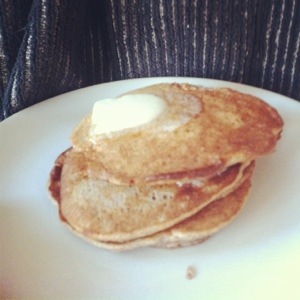 Today I took my recipe for my souffle, tweaked it and turned it into pancakes. It turned out great and everyone ate them…and not a spec of flour in them. Horray! They are a great way to get protein into your kids when all they want is a pancake. In a large bowl, beat egg whites stiff. In processor, throw everything else in and pulse until smooth. Fold yolk mixture into the whites quite well. Fry up on a pan at medium heat. These take a bit longer than traditional pancakes. When you flip them, squish them a bit to even them out as they are very fluffy. Top with butter, maple syrup, berries, drizzle of raw honey or the best…coconut cream whip! YUM.